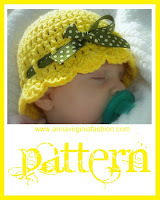 Here is a blog-post version of my baby hat pattern. You may print a copy of this post. Click on a photo to enlarge. The pattern is also a free PDF via Ravelry. You will need the latest version of Adobe to open the PDF. Please do not sell or redistribute as your own. Since I sell these hats, please do not make them for personal profit. Yarn: Peaches & Crème OR Sugar ‘n Cream 4-ply Worsted cotton yarn. Skeins: One 2.5 oz skein. *Notes: Beginning Ch 3 does NOT count as a dc. Begin first st instructions in the same st as the chs. Numbers in parentheses are the st count at the end of the round. 2 dc, 1 dc. Repeat to end of rnd. 2 dc, 1 dc in next two sts. Repeat to end of rnd. 2 dc, 1 dc in next three sts. Repeat to end of rnd. Rnd 11: Shell st as follows: Sc in st, Sk 1 st, (dc 5 times) in next st, sk 1 st.
Repeat shell st to end of round. In last 4 sts: make shell, sk 2 sts, sc in last st and sl st to first sc. Fasten off, weave in loose end. Weave ribbon as desired (fastest way is by threading ribbon through a yarn needle) in Round 9, tie a bow. Add contrasting color border to lower part of cap, stripes, or add flowers, buttons and/or embroidery. UPDATE 11/9/2012: A lot of you have asked for a diagram, so here is the little picture I drew up in paint. This is what I have emailed to those who have requested it! Click on the picture to see it enlarged. Do you have gauge details as I am from Australia and we dont have the same yarn weights so I need to make the pattern work with an Australian 8ply wool?? Let me measure really quick... I've been wanting to perfect my skills and increase my pattern's value and start including gauge, so this is good! You are wonderful! It's really great to see someone sharing patterns with the caveat that the items made can't be sold!!! Let's hope it catches on....how clever! I'm so glad that you like my stipulation! I've thought that it often makes people upset, but I'm not keeping them from modifying it and making it uniquely theirs. :) Good to hear from someone that doesn't view that negatively! Thanks! I am new at making hats and I am having a hard time understanding rounds 4 and 5. Could you please clarify, Am I just doing 3 dc in next 2 stitches or continuing with 2 dc in one stitch then next one dc in next stitch. My end of row count is always off. Thank you for your help. I sent a reply to your email (since you asked the same question in both places and I happened to get the email one first). Can u send me the answer to this question? I'm having trouble as well. This is such a cute hat! Thanks for sharing, I am new to crocheting and the instructions were great and easy to follow. I was able to make 2 in a few hours... The first one ended up doll size, but I figured out what I did wrong and the next one I made was newborn size and super cute. Thanks again! Thank you Anna. Lovely, cute hat! I love this pattern and I'm new to crocheting as well. I'm confused as to how to keep from getting a hole in the middle if that make since? After I dc 10 in the first ch, I have a hole in the center of my circle. Any idea as to what I'm doing wrong? Never,ind my first comment I figured it out but I do have the same question as Bernie did about round 4. Just to help you see the pattern, here's how it works from Round 1. By the way, the chains at the beginning of each row do *not* count as dc. Rnd 3: ch 3, 2 dc, 1 dc around (30 dc) -- that means in the first stitch, you do 2 dc. In the next stitch, you do 1 dc. Then you repeat the 2 dc, 1 dc, 2 dc, 1 dc until you get back to the beginning. Rnd 4: ch 3, 2 dc, 1 dc in next 2 sts (40 dc) -- in the first stitch, do 2 dc. The 2 next stitches only get 1 dc each. Then you do 2 dc, 1 dc, 1 dc, 2 dc, 1 dc, 1dc until you get around. Rnd 5: ch 2, 2 dc, 1 dc in next 3 sts (50 dc). If that still doesn't help, I can email you a diagram... I don't think I can upload a picture in the comments. Let me know if you're still confused! P.S. I LOVE this pattern and I use it as a basis for almost ALL of my hats that I make!! Could you please email me a diagram? I've got a diagram, but I don't have your email address! I tried following the link on your name, but I don't see any contact info there. Send me an email at shopannavirginia@gmail.com so that I can send you the crochet chart! I know that if I crochet 11 dc in the first round (and increase accordingly) and do 6 increasing rounds and 6 regular rounds (for a total of 12 rounds), then I get an adult-sized hat. I would try either using a bigger crochet hook (I know that using the "I" hook works for my toddlers' heads - they both have 19 inch head circumferences). Or you could try adding another increasing row and see how that works. But, if you add another increasing row, I would go with a smaller hook (start with G or H). Good luck! I'd love to hear how it works out! Thank you so much for sharing this pattern Anna! There are many expected babies soon at my church and I thought this would be a cute gift idea and would help me with giving something unique and made with love without going broke in the process, LOL! So far tonight I've done two. Hi! My english is not so good, but I hope that you understand what I mean. I wish you send me diagram on my email - daliborkaberi@yahoo.com. I tried you email but it didn't work. Please send me an email address and I'll try again! Hi, thanks for answer..I see that I write my email wrong...my email is daliborkaberic@yahoo.com. Sorry, my english is not so good :-). What a darling pattern! I really appreciate that you provide a step by step photo tutorial along with the pattern (I am a longtime knitting but new to crochet and I am looking to try different stitch patterns!) Thanks so much for sharing. I'm glad it's a helpful pattern! Thanks for letting me know - I'll keep it up! Hi Vicki, I think to make it fit a bigger ribbon, I would try doing Tr stitch for round 9 and a Sc stitch for round 10. It would hopefully not change too much of the stretch but still let you add a wider ribbon. That's funny it won't let you leave a pic but I'm glad it worked! Sorry to piggyback this comment on a reply (only way I could get it to work). I just wanted to say thank you for sharing this (and other) patterns. Haven't done them yet but from the comments I am confident they will work up lovely. Thanks again. Do you a video tutorial? I don't have a video tutorial! I think that is my next step in my crochet pattern creating, but I haven't gotten there yet, sorry!